At this time of the year I drive around and see lawns in the Piedmont area. I see a lot of people that have mowed up fall leaves and cut their lawns down the ground. I cringe at the sight of this and hope this will change as soon as the turf starts to regrow. If this continues and those lawns stay at this low height of cut they are already in an uphill battle for survival. Mowing is the first practice of maintaining a lawn. A lawn that is mowed at the proper height of cut is much healthier than a lawn to low. Proper height of cut will help your lawn density, withstand pest pressure, and affect water use and overall look better. Turf-Type Tall Fescue that we use today likes to cut from 3 to 5 inches. You should check that height from the floor to the blade, not the settings on the mower. 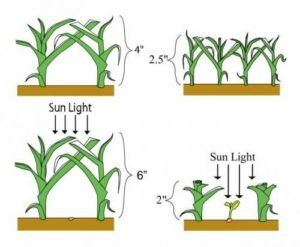 Taller plants will shade the soil area which reduces weed seed germination and aids in water loss during hot periods of the growing season. Higher heights of cut once established require less frequent mowing than lower heights of cut. Turf type grasses are designed to stay at the 3 to 5 inches and not grow like grass in a field. If you are mowing your lawn you have full control of this practice. If you have hired a mower to mow your lawn; stress the importance of height of cut. If they tell you lower is better then they are WRONG! The proper height of cut is one of the easiest ways to get a healthy and dense lawn. The winter season is a great time to train your grass height of cut before the spring flush of growth starts. The combination of proper cultural practices and our 7 step turf program will ensure you have a great looking lawn throughout the year. Contact us today if you need help with your lawn.